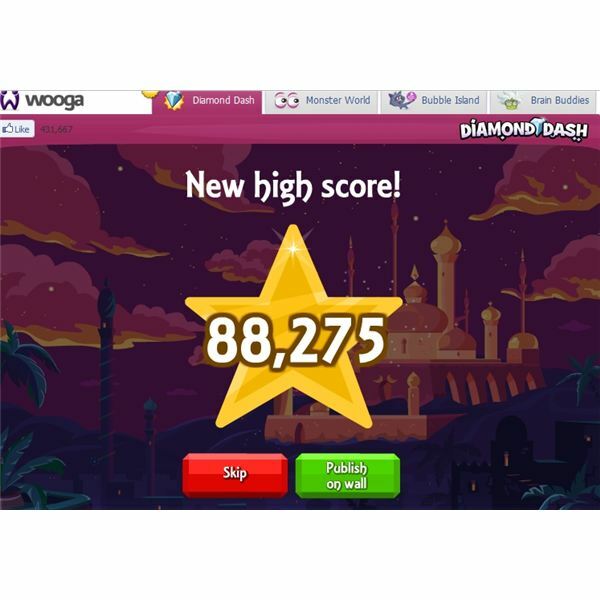 Diamond Dash is a social puzzle game by Wooga. 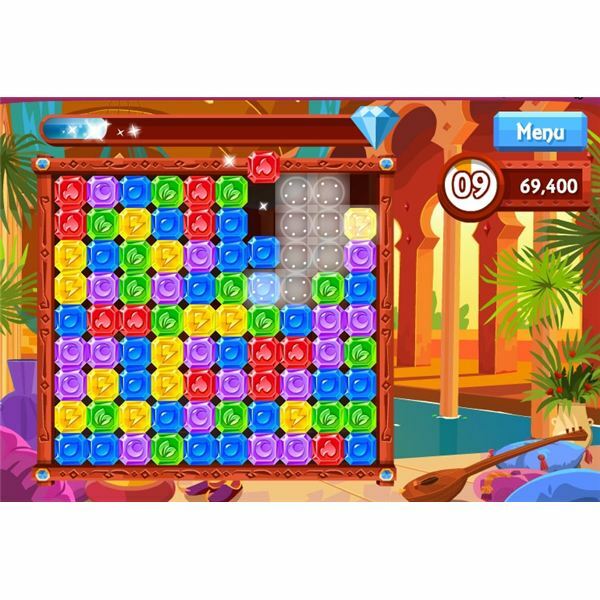 Comparable to Bejeweled Blitz players have exactly 60 seconds to match three or more gemstones of the same color. The game begins with a giant square of colored gems. When a player finds an adjoined match they simply click on one of the blocks for the entire row to disappear. More squares will fall down from the top of the box as matches are found. 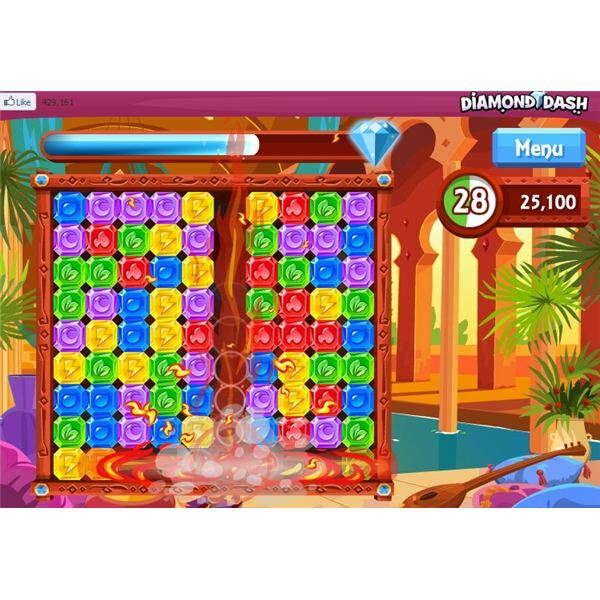 The main objective of the game is to eliminate gems as fast as possible. Occasionally power-ups are dropped in the form of a flaming diamond. This is called the magic fire power-up. Clicking on it will automatically explode surrounding matches. In order to score high earning multiple power-ups is essential. The secret to hitting magic fires is speed. A meter at the top of the screen displays how close a player is to accumulating a power-up. If possible it’s best to play Diamond Dash with the sound on. As gems are cleared a buzz rings. Instead of glancing up and away from the board gamers can listen to the chimes for clues. Quick consistent tones mean you’re going at a good pace and will be rewarded soon. The musical tone slows down when a player is stumped. A tick tock effect starts when the timer is about to buzz. Playing with the sound eliminates the need to look up at the clock or meter to monitor progress. The faster you play the better the odds. The only way to really master this puzzle game is to practice. Hearts or lives allow users to play another round. Each player starts with five hearts. Occasionally during leveling the magical panda guru will give out an extra life but it’s rare. Players have to wait until they’re restored again or ask friends to help out. A friend equals hearts. It’s important to have lots of generous pals. Browse Facebook fan pages for active players to add. Gaming forums devoted to finding neighbors like Gamers Unite is another excellent source. If you have at least a six or so buddies willing to regularly send gifts you’re set. A large number of friends make it easy to gain daily lives without resorting to spamming. Nothing is worst than sending out dozens of requests and only receiving several hearts in return. To level up and score high players must clear out gemstones quickly. Most of the time formations appear in small ‘L’ shapes. Look for two of the same colored blocks connected and one joined across. Scan the board for specific colors bunched together. Search horizontally, vertically, and diagonally for matching lines. Keep practicing until it becomes second nature. In each round always try to increase your speed. Don’t slow down when a magic fire drops. Activate the flaming diamond while continuing to click on matches for bonus points. Playing on a consistent basis is crucial for mastering speed and winning techniques. There are different methods for dominating this game. 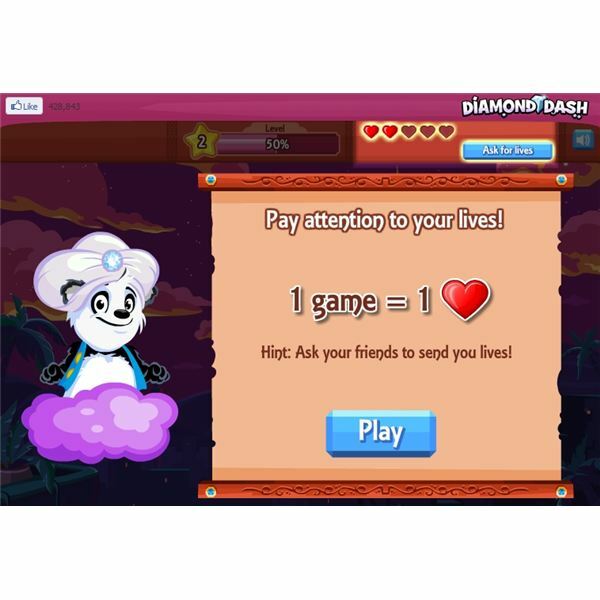 These Diamond Dash tips and hints are just a few of the effective ways a player can clear out gems and level up fast.